Chinhoyi University of Technology, P. Bag 7724, Chinhoyi, Zimbabwe. Biogas produced during anaerobic digestion (AD) of biodegradable organic materials. AD is a series of biochemical reactions in which microorganisms degrade organic matter under anaerobic conditions. There are many biomass resources that can be degraded by AD to produce biogas. Biogas consists of methane, carbon dioxide, and trace amounts of other gases. The gamut of feedstocks used in AD includes animal manure, municipal solid waste, sewage sludge, and various crops. Several factors affect the potential of feedstocks for biomethane production. The factors include nutrient content, total and volatile solids (VS) content, chemical and biological oxygen demand, carbon/nitrogen ratio, and presence of inhibitory substances. The biochemical methane potential (BMP), often defined as the maximum volume of methane produced per g of VS substrate provides an indication of the biodegradability of a substrate and its potential to produce methane via AD. The BMP test is a method of establishing a baseline for performance of AD. BMP data are useful for designing AD parameters in order to optimise methane production. Several methods which include experimental and theoretical methods can be used to determine BMP. The objective of this paper is to review several methods with a special focus on their advantages and disadvantages. The review shows that experimental methods, mainly the BMP test are widely used. The BMP test is credited for its reliability and validity. There are variants of BMP assays as well. Theoretical models are alternative methods to estimate BMP. They are credited for being fast and easy to use. Spectroscopy has emerged as a new experimental tool to determine BMP. Each method has its own advantages and disadvantages with reference to efficacy, time, and ease of use. Choosing a method to use depends on various exigencies. More work needs to be continuously done in order to improve the various methods used to determine BMP. The biomethane potential (BMP) provides baseline data for the performance of AD. Both experimental and theoretical methods to determine BMP have been reviewed. The BMP test is the most widely used method and is credited for reliability and validity of its results. Abbassi-Guendouz, A., Brockmann, D., Trably, E., Dumas, C., Delgene`s, J.P., Steyer, J.P., Escudie, R., 2012. Total solids content drives high solid anaerobic digestion via mass transfer limitation. Bioresour. Technol.111, 55-61. Adhikari, R., 2006. Sequential batch and continuous anaerobic digestion of municipal solid waste in pilot scale digesters. MSc Thesis, Asian Institute of Technology, Thailand. Al Seadi, T., Ruiz, D., Prassl, H., Kottner, M., Finsterwaldes, T., Volke, S., Janssers, R., 2008. Handbook of Biogas, University of Southern Denmark, Esbjerg. Allen, E., Browne, J.D., Murphy, J.D., 2013. Evaluation of the biomethane yield from anaerobic co-digestion of nitrogenous substrates. Environ. Technol. 34(13-14), 2059-2068. Amon, T., Amon, B., Kryvoruchlo, V., Machmuller, A., Hopfner-Sixt, K., Bodiroza, V., Hrbek, R., Friedel, J., Potsch, E., Wagentristl, H., Schreiner, M., 2007. Methane production through anaerobic digestion of various energy crops grown in sustainable crop rotations. Bioresour. Technol. 98(17), 3204-3212. Angelidaki, I., Alves, M., Bolzonella, D., Borzaconni, L., Campos, J.L., Guwy, A.J., Kalyuzhnyi, S., Jenicek, P., van Lier, J.B., 2009. Defining the biomethane potential (BMP) of solid organic wastes and energy crops: a proposed protocol for batch assays. Water Sci. Technol. 59(5), 927-934. Angelidaki, I., Sanders, W., 2004. Assessment of the anaerobic biodegradability of macropollutants. Rev. Environ. Sci. Biotechnol. 3(2), 117-129. Angelidaki, I., Schmidt, J.E., Ellegaard, L., Ahring, B.K., 1998. An automatic system for simultaneous monitoring of gas evolution in multiple closed vessels. J. Microbiol. Methods. 33(1), 93-100. Arsova, L., 2010. Anaerobic digestion of food waste: current status, problems and an alternative product. MSc Thesis, Columbia University, New York, USA. Babaee, A., Shayegan, J., 2011. Effect of organic loading rates (OLR) on production of methane from anaerobic digestion of vegetables waste. World Renewable Energy Congr. (WREC). 8-13. Linköping. Badshah, M., Lam, D.M., Liu, J., Mattiasson, B., 2012. Use of an automatic methane potential test system for evaluating the biomethane potential of sugarcane bagasse after different treatments. Bioresour. Technol. 114, 262-269. Bekiaris, G., Triolo, J.M., Peltre, C., Pedersen, L., Jensen, L.S., Bruun, S., 2015. Rapid estimation of the biochemical methane potential of plant biomasses using fourier transform mid-infrared spectroscopy photoacoustic spectroscopy. Bioresour. Technol. 197, 475-481. Bellaton, S., Guérin, S., Pautremat, N., Bernier, J., Muller, M., Motellet, S., Azimi, S., Pauss, A., Rocher, V., 2016. Early assessment of a rapid alternative method for the estimation of the biomethane potential of sewage sludge. Bioresour. Technol. 206, 279-284. Braun, R., Weiland, P., Wellinger, A., 2009. Biogas from energy crop digestion. IEA Task 37 Brochure, International Energy Agency, Paris. Browne, J.D., Murphy, J.D., 2013. Assessment of the resource associated with biomethane from food waste. Appl. Energy. 104, 170-177. California Integrated Waste Management Board (CIWMB), 2008. Current anaerobic digestion technologies used for treatment of municipal of organic waste. Chae, K.J., Jang, A.M., Yim, S.K., Kim, I.S., 2008. The effects of digestion temperature and temperature shock on the biogas yields from the mesophilic anaerobic digestion of swine manure. Bioresour. Technol. 99(1), 1-6. Chandra, R., Takeuchi, H., Hasegawa, T., 2012. Methane production from lignocellulosic agricultural crop wastes: a review in context to second generation of biofuel production. Renew. Sust. Energy Rev. 16(3), 1462-1476. Chen, Y., Cheng, J.J., Creame, K.S., 2008. Inhibition of anaerobic digestion process: a review. Bioresour. Technol. 99(10), 4044-4064. Corno, L., Pilu, R., Adani, F., 2014. Arundo donax L.: a non-food crop for bioenergy and bio-compound production. Biotechnol. Adv. 32(8), 1535-1549. Davis, R., Mauer, L.J., 2010. Fourier tansform infrared (FT-IR) spectroscopy: a rapid tool for detection and analysis of foodborne pathogenic bacteria, in: Mendez-Vilas, A. (Ed. ), Current research, technology and education topics in applied microbiology and microbial biotechnology. Formatex Research Center, Indiana, pp. 1582-1594. De Baere, L.A., Devocht, M., Van Assche, P., Verstraete, W., 1984. Influence of high NaCl and NH4Cl salt levels on methanogenic associations. Water Res. 18(5), 543-548. De Clercq, D., Wen, Z., Fan, F., Caicedo, L., 2016. Biomethane production potential from restaurant food waste in megacities and project level-bottlenecks: a case study in Beijing. Renew. Sust. Energy Rev. 59, 1676-1685. De Mes, T.Z.D., Stams, A.J.M., Reith, J.H., Zeeman, G., 2003. Methane production by anaerobic digestion of wastewater and solid wastes, in: Reith, J.H., Wijffels, R.H., Barten, H. (Eds. ), Bio-methane and Biohydrogen: status and perspectives of biological methane and hydrogen production. Dutch Biological Hydrogen Foundation, Petten, pp. 58-102. Deublein, D., Steinhauser, A., 2010. Biogas from waste and renewable sources: an introduction. John Wiley & Sons. Dioha, I.J., Ikeme, C.H., Nafi’u, T., Soba, N.I., Yusuf, M.B.S., 2013. Effect of carbon to nitrogen ratio on biogas production. Int. Res. J. Nat. Sci. 1(3), 1-10. Doublet, J., Boulanger, A., Ponthieux, A., Laroche, C., Poitrenaud, M., Cacho Rivero, J.C., 2013. Predicting the biochemical methane potential of wide range of organic substrates by near infrared spectroscopy. Bioresour. Technol. 128, 252-258. Elbeshbishy, E., Nakhla, G., Hafez, H., 2012. Biochemical methane potential (BMP) of food waste and primary sludge: influence of inoculum pre-incubation and inoculum source. Bioresour. Technol. 110, 18-25. Ertem, F.C., 2011. Improving biogas production by anaerobic digestion of different substrates: calculation of potential energy outcomes. MSc Thesis, Halmstad University, Halmstad. Esposito, G., Frunzo, L., Liotta, F., Panico, A., Pirozzi, F., 2012. Bio-methane potential tests to measure the biogas production from the digestion and co-digestion of complex organic substrates. Open Environ. Eng. J. 5, 1-8. Esteves, S., Miltner, M., Fletch, S., 2012. Monitoring review and guide for the optimisation of anaerobic digestion and biomethane plants. Full Report. European Communities (EC), 2002. Proceedings of the workshop on hamornisation anaerobic biodegradation, Activity and Inhibition Assays, Lago d’Orta, Italy. Feng, L., Li, Y., Chen, C., Liu, X., Xiao, X., Ma, X., Zhang, R., He, Y., Liu, G., 2013. Biochemical methane potential (BMP) of vinegar residue and the influence of feed to inoculums ratios on biogas production. Bioresources. 8(2), 2487-2498. Fogacs, G., 2012. Biogas production from citrus wastes and chicken feather: pretreatment and co-digestion. PhD Thesis, Chalmers University of Technology, Göteborg. Forster-Carneiro, T., Pe´rez, M., Romero, L.I., 2008. Influence of total solid and inoculum contents on performance of anaerobic reactors treating food waste. Bioresour. Technol. 99(15), 6994-7002. Gao, R., Yuan, X., Zhu, W., Wang, X., Chen, S., Cheng, X., Cui, Z., 2012. Methane yield through anaerobic digestion for various maize varieties in China. Bioresour. Technol. 118, 611-614. Gerardi, M.H., 2003. The microbiology of anaerobic digesters, John Wiley & Sons. Godin, B., Mayer, F., Agneessens, R., Gerin, P., Dardenne, P., Delfosse, P., Delcarte, J., 2015. Biochemical methane potential prediction of plant biomasses: comparing chemical composition versus near infrared methods and linear versus non-linear models. Bioresour. Technol. 175, 382-390. Gunaseelan, V.N., 2004. Biochemical methane potential of fruits and vegetable solid waste feedstocks. Biomass Bioenergy. 26(4), 389-399. Gunaseelan, V.N., 2007. Regression models of ultimate methane yields of fruits and vegetable solid wastes, sorghum and napiergrass on chemical composition. Bioresour. Technol. 98(6), 1270-1277. Hamilton, D.W., 2012. Organic matter content of wastewa­ter and manure. BAE 1760, Oklahoma Cooperative Extension Service, Stillwater, Oklahoma. Hansen, T.L., Schmidt, J.E., Angelidaki, I., Marca, E., la Cour Jansen, J., Mosbaek, H., Christensen, T.H., 2004. Method for determination of methane potentials of solid organic waste. Waste Manage. 24(4), 393-400. Hobbs, P., Ward, A., Pardo, G., 2007. Biogas for agriculture, Iger Innovations. Horváth, I.S., Tabatabaei, M., Karimi, K., Kumar, R., 2016. Recent updates on biogas production-a review. Biofuel Res. J. 3(2), 394-402. Hussain, A., Dubey, S.K., 2017. Specific methanogenic activity test for anaerobic degradation of influents. Appl. Water Sci. 7(2), 535-542.
 International Energy Agency, 2009. Biogas production and utilization, IEA Task 37 Brochure. International Energy Agency, Paris. International Energy Agency, 2013. Biogas production and utilization. Isci, A., Demir, G.N., 2007. Biogas production potential from cotton wastes. Renewable Energy. 32(5), 750-757. ISO 11734, 1995. Water quality-evaluation of the ‘‘ultimate’’ anaerobic biodegradability of organic compounds in digested sludge-method by measurement of the biogas production. ISO Guideline 11734, European Committee for Standardization, Brussels. Ivo Achu, N., 2012. Anaerobic digestion of crop and waste biomass: impact of feedstock characteristics on process performance. PhD Thesis, Lund University (Media-Tryck), Sweden. Jijai, S., Srisuwan, G., O-thong, S., Ismail, N., Siripatana, C., 2014. Specific methanogenic activities (SMA) and biogas production of different granules size and substrates. The 1st Environment and Natural Resources International Conference, The Sukosol hotel, Bangkok, Thailand, pp. 1-4. Jingura, R.M., Musademba, D., Matengaifa, R., 2010. An evaluation of utility of Jatropha curcas L. as a source of multiple energy carriers. Int. J. Eng. Sci. Technol. 2(7), 115-122. Kawai, M., Nagao, N., Tajima, N., Niwa, C., Matsuyama, T., Toda, T., 2014. The effect of the labile organic fraction in food waste and the substrate/inoculum ratio on anaerobic digestion for a reliable methane yield. Bioresour. Technol. 157, 174-180. Khalid, A., Arshad, M., Anjum, M., Mahmood, T., Dawson, L., 2011. Review-the anaerobic digestion of solid organic waste. Waste Manage. 31(8), 1737-1744. Kizil, R., Irudayaraj, J., 2013. Fourier transform infrared photoacoustic spectroscopy (FTIR-PAS), in: Roberts, G. (Ed. ), Encyclopaedia of Biophysics: Springer Reference. Springer-Verlag, Berlin, Heidelberg, pp. 880-844. Koch, K., Fernández, Y.B., Drewes, J.E., 2015. Influence of headspace flushing on methane production in biochemical methane potential (BMP) tests. Bioresour. Technol. 186, 173-178. Korres, N., O'Kiely, P., Benzie, J.A., West, J.S., 2013. Bioenergy production by anaerobic digestion: using agricultural biomass and organic wastes. Routledge, Taylor & Francis Publishing Group, London, pp. 442. Kuusik, A.R.G.O., Kuusik, A.A.R.E., Loigu, E., Sokk, O.L.E.V., 2013. Predicting preferable substrate blends for the production of biogas. Proceedings of the 9th International Conference on Energy, Environment, Ecosystems and Sustainable Development (EEESD '13), Lemesos, Cyprus, pp. 192-197. Kwietniewska, E., Tys, J., 2014. Process characteristics, inhibition factors and methane yields of anaerobic digestion process, with particular focus on microalgal biomass fermentation. Renew. Sust. Energy Rev. 34, 491-500. Labatut, R.A., Angenent, L.T., Scott, N.R., 2011. Biochemical methane potential and biodegradability of complex organic substrates. Bioresour. Technol. 102(3), 2255-2264. Lebersorger, S., Schneider, F., 2011. Discussion on the methodology for determining food waste in household waste composition studies. Waste Manage. 31(9-10), 1924-1933. Lesteur, M., Latrille, E., Bellon-Maurel, V.B., Roger, J.M., Gonzalez, C., Junqua, G., Steyer, J.P., 2011. First step towards a fast analytical method for the determination of biochemical methane potential of solid waste by near infrared spectroscopy. Bioresour. Technol. 102(3), 2280-2288. Mahmood, A., Ullah, H., Ijaz, M., Javaid, M.M., Shahzad, A.N., Honermeier, B., 2013. Evaluation of sorghum hybrids for biomass and biogas production. Aust. J. Crop Sci. 7(10), 1456-1462. Manley, M., 2014. Near-infrared spectroscopy and hyperspectral imaging: non-destructive analysis of biological materials. Chem. Soc. Rev. 43, 8200-8214. Mayer, F., Gerin, P.A., Noo, A., Foucart, G., Flammang, J., Lemaigre, S., Sinnaeve, G., Dardenne, P., Delfosse, P., 2014. Assessment of factors influencing the biomethane yield of maize silages. Bioresour. Technol. 153, 260-268. McCarty, P.L., 1972. Energetics of organic matter degradation, in: Mitchell, R. (Ed. ), Water Pollution Microbiology. John Wiley & Sons, Inc., New Jersey, pp. 91-118. Menardo, S., Airoldi, G., Balsari, P., 2012. The effect of particle size and thermal pre-treatment on the methane yield of four agricultural by-products. Bioresour. Technol. 104, 708-714. Meng, Y., Li, S., Yuan, H., Zou, D., Liu, Y., Zhu, B., Chufo, A., Jaffer, M., Li, X., 2015. Evaluating biomethane production from anaerobic mono-and co-digestion of food waste and floatable oil (FO) skimmed from food waste. Bioresour. Technol. 185, 7-13. Monnet, F., 2003. An introduction to the anaerobic digestion of organic waste. Remade Scotland. 1-48. Moody, L.R., Burns, R., Wu-Haan, W., Spajić, R., 2009. Use of biochemical methane potential (BMP) assays for predicting and enhancing anaerobic digester performance. Proceedings of the 4th International and 44th Croatian Symposium of Agriculture, Optija. Mshandete, A., Bjornsson, L., Kivaisi, A.K., Rubindamayugi, M.S., Matthiasson, B., 2006. Effect of particle size on biogas yield from sisal fibre waste. Renewable Energy. 31(14), 2385-2392. Nalinga, Y., Legonda, I., 2016. The effect of particles size on biogas production. Int. J. Innovative Res. Technol. Sci. 4(2), 9-13. Navarro-Pineda, F.S., Baz-Rodriguez, S.A., Handler, R., Sacramento-Rivero, J.C., 2016. Advances on the processing of Jatropha curcas towards a whole-crop biorefinery. Renew. Sust. Energy Rev. 54, 247-269. Nielfa, A., Cano, R., Fdz-Polanco, M., 2015. Theoretical methane production generated by the co-digestion of organic fraction municipal solid waste and biological sludge. Biotechnol. Rep. 5, 14-21. Noyola, A., Morgan-Sagastume, J.M., Lo´pez-Herna´ndez, J.E., 2006. Treatment of biogas produced in anaerobic reactors for domestic wastewater: odor control and energy/resource recovery. Rev. Environ. Science. Bio. 5(1), 93-114. Oslaj, M., Mursec, B., Vindis, P., 2010. Biogas production from maize hybrids. Biomass Bioenergy. 34(11), 1538-1545. Pavan, P., Battistoni, P., Mata-Alvarez, J., 2000. Performance of thermophilic semi-dry anaerobic digestion process changing the feed biodegradability. Water Sci. Technol. 41(3), 75-81. Pham, C.H., Triolo1, J.M., Cu, T.T.T., Pedersen, L., Sommer, S.G., 2013. Validation and recommendation of methods to measure biogas production potential of animal manure. Asian Australas. J. Anim. Sci. (AJAS). 26(6), 864-873. 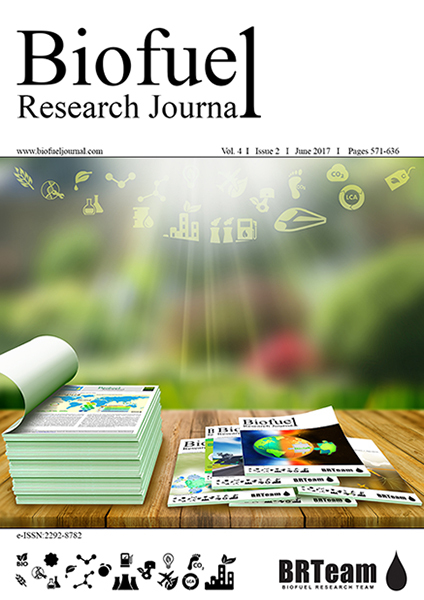 Raju, C.S., Ward, A.J., Nielsen, L., Moller, H.B., 2011. Comparison of near infra-red spectroscopy, neutral detergent fibre assay and in-vitro organic matter digestibility assay for rapid determination of the biochemical methane potential of meadow grasses. Bioresour. Technol. 102(17), 7835-7839. Raju, C.S., 2015. Optimization of the anaerobic digestion process by substrate pre-treatment and the application of NIRS. Technical report BCE-TR-1. Department of Engineering, Aarhus University., Denmark, pp. 96. Rath, J., Heuwinkel, H., Herrmann, A., 2013. Specific biogas yield of maize can be predicted by the interaction of four biochemical constituents. Bioenergy Res. 6(3), 939-952. Rodriguez Chiang, L.M., 2011. Methane potential of sewage sludge to increase biogas production. TRITA LWR Degree Project 11-22, Royal Institute of Technology, Stockholm. Scaglia, B., D’Imporzano, G., Garuti, G., Negri, M., Adani, F., 2014. Sanitation ability of anaerobic digestion performed at different temperature on sewage sludge. Sci. Total Environ. 466-467, 888-897. Schievano, A., Pognani, M., D’Imporzano, G., Adani, F., 2008. Predicting anaerobic biogasification potential of ingestates and digestates of full-scale biogas plant using chemical and biological parameters. Bioresour. Technol. 99(17), 8112-8117. Schievano, A., Scaglia, B., D’Imporzano, G., Malagutti, L., Gozzi, A., Adani, F., 2009. Prediction of biogas potentials using quick laboratory analyses: upgrading previous models for application to heterogeneous organic matrices. Bioresour. Technol. 100(23), 5777-5782. Schittenhelm, S., 2008. Chemical composition and methane yield of maize hybrids with contrasting maturity. Eur. J. Agron. 29(2-3), 72-79. Sell, S.T., Burns, R.T., Raman, D.R., Moody, L.B., 2010. Approaches for selecting anaerobic digestion co-substrates for a full-scale beef manure digester using biochemical methane potentials and anaerobic toxicity assays. Proceedings of theInternational Symposium on Air Quality and Manure Management for Agriculture, Agricultural and Biosystems Engineering Conference, Dallas Texas. Sepalla, M., 2013. Biogas production from high-yielding energy crops in boreal conditions. Academic Thesis, University of Jyväskylä, Jyväskylä, Finland. Shi, C., 2012. Potential biogas production from fish waste and sludge. MSc Thesis, Royal Institute of Technology (KTH), Stockholm. Singh, R.N., Vyas, D.K., Srivastava, N.S.L., Narra, M., 2008. SPERI experience on holistic approach to utilize all parts of Jatropha curcas fruit for energy. Renewable Energy. 33(8), 1868-1873. Sosnowski, P., Wieczorek, A., Ledakowicz, S., 2003. Anaerobic co-digestion of sewage sludge and organic fraction of municipal solid wastes. Adv. Environ. Res. 7(3), 609-616. Spanjers, H., van Lier, J.B., 2006. Instrumentation in anaerobic treatment-research and practice. Water Sci. Technol. 53(4-5), 63-76. Speece, R.E., 1996. Anaerobic biotechnology for industrial wastewaters. Archae Press, Nashville, Tennessee. Strong, P.J., Kalyuzhnaya, M., Silverman, J., Clarke, W.P., 2016. A methanotroph-based biorefinery: potential scenarios for generating multiple products from a single fermentation. Bioresour. Technol. 215, 314-323. Switzenbaum, M.S., 1995. Obstacles in the implementation of anaerobic treatment technology. Bioresour. Technol. 533(3), 255-262. Symons, G.E., Buswell, A.M., 1933. The methane fermentation of carbohydrates1, 2. J. Am. Chem. Soc. 55(5), 2028-2036. Teghammar, A., 2013. Biogas production from lignocelluloses: pre-treatment, substrate characterisation, co-digestion and economic evaluation. PhD Thesis, Chalmers University of Technology, Sweden. Thomsen, S.T., Spliid, H., Østergård, H., 2014. Statistical prediction of biomethane potentials based on the composition of lignocellulosic biomass. Bioresour. Technol. 154, 80-86. Triolo, J.M., Ward, A.J., Pedersen, L., Lokke, M.M., Qu, H., Sommer, S.G., 2014. Near infrared reflectance spectroscopy (NIRS) for rapid determination of biochemical methane potential of plant biomass. Appl. Energy. 116, 52-57. Triolo, J.M., Sommer, S.G., Møller, H.B., Weisbjerg, M.R., Jiang, X.Y., 2011. A new algorithm to characterise biodegradability of biomass during anaerobic digestion: influence of lignin concentration on methane production potential. Bioresour. Technol. 102(20), 9395-9402. VDI 4630, 2006. Fermentation of organic materials-characterisation of the substrate, sampling, collection of material data, fermentation tests, VDI Guideline 4630. Verein Deutscher Ingenieure, Düsseldorf. Wall, D.M., O’Kiely, P., Murphy, J.D., 2013. The potential for biomethane from grass and slurry to satisfy renewable energy targets. Bioresour. Technol. 149, 425-431. Wang, B., 2016. Factors that influence the biochemical methane potential (BMP) test. PhD Thesis, Lund University, Switzerland. Wang, X., Lu, X., Li, F., Yang, G., 2014. Effects of temperature and carbon-nitrogen (C/N) ratio on the performance of anaerobic co-digestion of dairy manure, chicken manure and rice straw: focusing on ammonia inhibition. PLoS ONE. 9(5), e97265. Wang, B., Nges, I.A., Nistor, M., Liu, J., 2014. Determination of methane yield of cellulose using different experimental setups. Water Sci. Technol. 70(4), 599-604. Ward, A.J., 2016. Near-Infrared spectroscopy for determination of the biochemical methane potential: state of the art. Chem. Eng. Technol. 39(4), 611-619. Ward, A.J., Hobbs, P.J., Holliman, P.J., Jones, D.L., 2008. Optimisation of the anaerobic digestion of agricultural resources. Bioresour. Technol. 99(17), 7928-7940. Weiland, P., 2010. Biogas production: current state and perspectives. Appl. Microbiol. Biotechnol. 85(4), 849-860. Ye, Y., Zamalloa, C., Lin, H., Yan, M., Schmidt, D., Hu, B., 2015. Evaluation of anaerobic co-digestion of dairy manure with food wastes via bio-methane potential assay and CSTR reactor. J. Environ. Sci. Health, Part B. 50(3), 217-227. Yi, J., Dong, B., Jin, J., Dai, X., 2014. Effect of increasing total solids contents on anaerobic digestion of food waste under mesophilic conditions: performance and microbial characteristics analysis. PLoS ONE. 9(7), e102548. Yoon, Y.M., Kim, S.H., Shin, K.S., Kim, C.H., 2014. Effects of substrate to inoculum ratio on the biochemical methane potential of piggery slaughterhouse wastes. Asian Australas. J. Anim. Sci. 27(4), 600-607. Qamaruz Zaman, N., 2010. The applicability of batch tests to assess biomethanation potential of organic waste and assess scale up to continuous reactor systems. PhD Thesis, University of Canterbury, Christchurch. Zhang, R., El-Mashad, H.M., Hartman, K., Wang, F., Liu, G., Choate, C., Gamble, P., 2007. Characterization of food waste as feedstock for anaerobic digestion. Bioresour. Technol. 98, 929-935. Zhou, H., Meng, A., Long, Y., Li, Q., Zhang, Y., 2014. Classification and comparison of municipal solid waste based on thermochemical characteristics. J. Air Waste Manage. Assoc. 64(5), 597-616. Zhou, S.Q., 2010. Theoretical stoichiometry of biological denitrifications. Environ. Technol. 22(8), 869-880.